This is the third stage of the Independent Care Review. The Care Review will use the Journey stage to begin to deliver improvements for infants, children and young people who experience care. Different methods will be used and will involve a strength-based and appreciative approach to encourage and stimulate things that are already working well. The Care Review will continue to establish clear evidence of what works best for children and young people and their families, recognising that relying on existing evidence will only deliver so much change. This will need a change in thinking and practice. The Care Review will provide support to try out new ways of doing things. Learning from this will inform what is really needed to improve care including changes in policy and the law. The outcome will be a series of new initiatives right across Scotland for a range of children and young people in care, families on the edge of care, and care-experienced adults, as well as identification of the pioneers – those people ready and willing to try something different. The Care Review will be using traffic light symbols to identify, stimulate and support change. These pages will be updated with information about the opportunities to take part in and influence this area of the work as it develops. 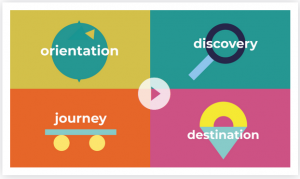 The Journey stage will involve ten working groups – each following interconnecting paths to explore areas of practice that need deeper understanding. The rich learning and evidence base from the Discovery stage will be used to support this. The Intentions are central to the work – guiding them along their path. The groups will build knowledge and confidence about how to address challenges, identify good practice, and encourage innovation. Each of the Journey groups has two co-chairs who bring a blend of lived and professional experience to the work. The Stop:Go group will endeavour to deliver transformational change within the care system, prior to the concluding recommendations of the Independent Care Review. The Voices of those heard within the Discovery phase of the review will underpin and guide the work of this workstream. Children and young people spoke a lot about how stigma affects them in the Discovery stage and so this group are exploring ways to understand what causes stigma and what must be done to combat it. The Love ambassadors will continue this important conversation while learning about what love really means to infants, children and young people in care and how to make sure their daily lives are filled with it! The Care Review heard a lot about issues relating to rights in the Discovery stage and so this group are working on making sure that the rights of children and young people who experience care are known to them, respected and upheld. To properly understand what happens at each end of the ‘care system’ – the points that infants, children and young people are taken into care and the points that they leave care. To explore how the justice system contributes to infants, children and young people going into care, the experience of secure care, and to consider how the ‘care system’ can criminalise children and young people. To understand health and wellbeing in the ‘care system’, the conditions that result in infants, children and young people being taken into care, what happens when they leave care and the impact on their health and wellbeing. 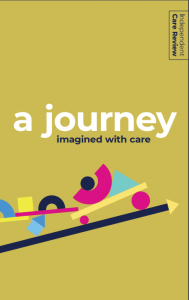 To consider and understand the impact of each of the components of the ‘care system’, the journeys between them and mapping a day / week / month / year in the life of a young person in care. To give full consideration to the entirety of the care workforce, paid and unpaid, how they interact with each other in the interests of infants, children and young people, and how they are trained and supported to do this. To scope out the best of what works in other parts of the world and give full consideration to what Scotland can learn and do to be the best place to grow up. The Journey group is formed of the Chair of the Review and the work group Co-chairs. The group will meet on a monthly basis. You can find out more about who is involved on the who we are page.